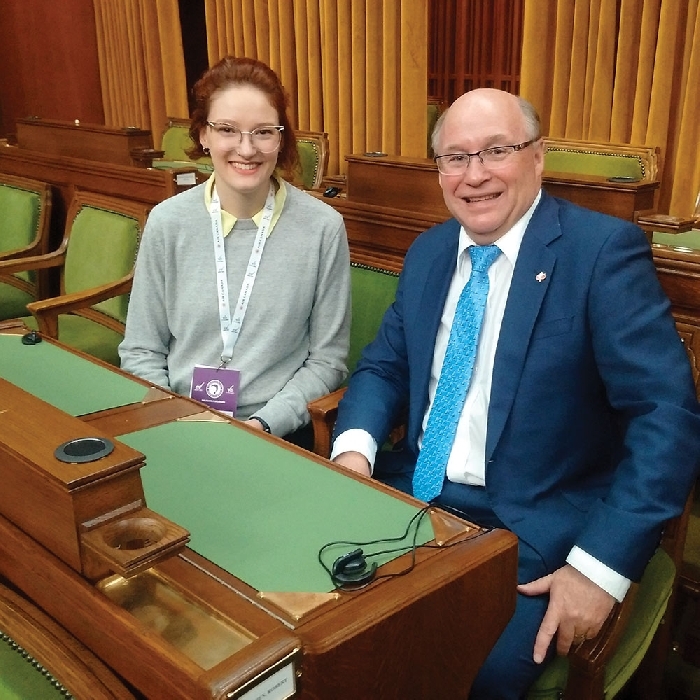 Souris-Moose Mountain Daughters of the Vote delegate Brit Sippola, who grew up outside of Whitewood, and Souris-Moose Mountain MP Dr. Robert Kitchen in the House of Commons last week. Brit Sippola went to Ottawa representing Souris-Moose Mountain in Daughters of the Vote, hoping to learn something about politics. She learned more than she ever could have imagined as she and others turned their backs on Prime Minister Justin Trudeau in the House of Commons Wednesday and gained national media attention. On Monday night last week, the women met with Jody Wilson-Raybould, who had resigned from cabinet over the SNC Lavalin affair, but was still a member of the Liberal caucus at that point. “It was really cool to meet her,” says Sippola. “She got everybody’s attention. People were thrilled to see her. She had a huge amount of supporters in the room. “This really struck a chord with a lot of us. Equal Voice (the group that organized the Daughters of the Vote event) is a multipartisan organization, so there are people from all across the political spectrum and this message rang out for us. “It was an indigenous delegate’s idea to turn our backs as a way to silently show that we were upset with his actions and with how he has treated these women, and his actions throughout this entire scandal. She said she made the decision to turn her back on the Prime Minister on the day the women were in the House of Commons. “It was talked about hypothetically the night before,” she said, “but there was no firm plan in place. “However, just before Justin Trudeau came in, whispers went out throughout the room and I think it kind of connected people who hadn’t already heard the plan. People were whispering throughout the House, saying ‘this is what we’re going to do,’ so I honestly couldn’t tell you how many people were turned around, because I was turned around. I couldn’t see them. But a number of us chose to turn our backs when he walked in. Some of us stayed with our backs turned the whole time, some people joined us partway through. Sippola said she is shocked by the amount of coverage of the women’s act of protest across the country. “I have been completely shocked, honestly,” she said. “I didn’t get the sense that any of us thought this was going to make a big splash or anything. It’s been interesting that it has. “A lot of us have been interviewed, a lot of us have seen the headlines and it’s been really interesting. A lot of people from across the country who have never heard of Daughters of the Vote have now, and that’s a big win for our organization. It’s definitely an unintended consequence. “The night before we went to the house, Equal Voice reminded us to make sure we were respectful, that there would be no heckling, so we made sure to be quiet and respectful as we protested. Equal Voice didn’t anticipate that the Daughters were going to do something like this. I’ve been really thrilled to see the impact our message has had, and how powerful it was. 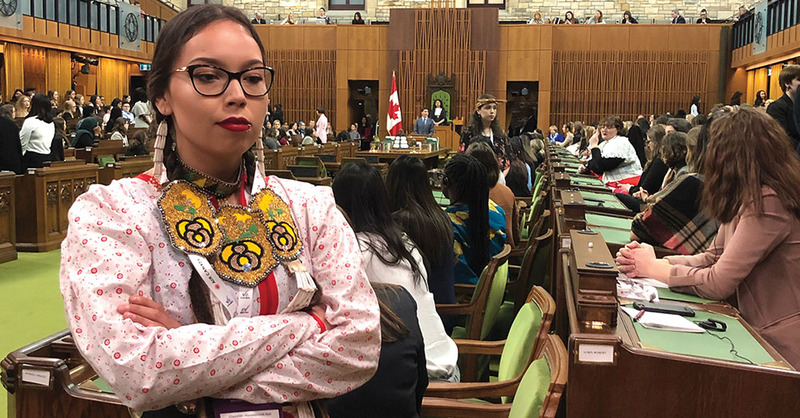 Kailey-Arthurson, the Daughters of the Vote representative for Churchill-Keewatinook Aski which covers all of Northern Manitoba, turns her back on Prime Minister Justin Trudeau in the House of Commons Wednesday. Sippola had an opportunity to speak about electoral reform in the House of Commons. In her speech she reminded people that Prime Minister Justin Trudeau had promised voters that the 2015 election would be the last election on the first past the post system, and he reneged on that promise. “I spoke about voting reform. I personally think we should explore different options. I want to eliminate first-past-the-post. It’s not up to me to decide what form that takes, whether it’s mixed member representation, proportional representation, ranked ballot—that’s up to the Canadian people to decide. I wanted the Liberal Party to follow through with their promise to eliminate first-past-the-post. Daughters of the Vote brings together young women with an interest in politics from across the country. Each woman represents one federal constituency. “Daughters of the vote is run by an organization called Equal voice,” explains Sippola. “Equal voice is a multipartisan group that wants to encourage more women to get into politics. Daughters of the Vote is an event Equal Voice puts on where they bring one young woman from every federal riding in Canada and they bring them together for a week of training and workshops, and they bring them to Parliament. They select some women to speak in Parliament, and some of them give testimony to different subcommittees. Sippola said she has always had an interest in politics. “My father, Larry Sippola is a farmer and works at the potash mine, but has always been super involved in the community, whether being on the Co-op board, a hockey coach or municipal council. My grandfather has been hugely involved in the community, including serving on town council. I’ve been surrounded by political discussion all my life. We’ve always been interested in following the news, and in history and current events. It’s always been a love of mine and something I’m interested in pursuing. Sippola said Daughters of the Vote was a learning experience.